What does it mean to lead with respect? Is it simply a matter of embracing a handful of new behavioral practices? That is where everyone starts out in their quest to understand and practice Real Lean. I did as well, more than 20 years ago. So did the Scientific Management people 85 years ago. But soon, you will discover, as everyone eventually does, that new behaviors, though seemingly full of promise, will not take you very far. The fact that we have so few capable Lean leaders bears testament to the limited impact of changing one’s behaviors. And, the “Respect for People” principle must never be reduced to a Lean tool, as this will do more harm than good. A great deal of additional research, thought, and analysis must applied to uncover what exists beyond a few observable leadership behaviors. There are numerous details, nuances, and interrelationships that exist below the surface that go into making capable Lean leaders. These include critically important economic, social, and political beliefs about business that differ greatly between conventional leaders and Lean leaders. The image at right shows that leading people in ways that respect them and their interests includes much more than leaders’ behaviors. 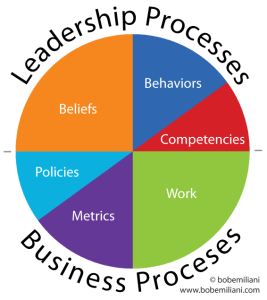 It encompasses leadership processes, of which behaviors is a part, and business processes. Behaviors is but one of six major elements that must be improved to lead people in ways that are consistent with Lean principles and practices. To focus solely on behaviors is akin to knowing how to play only seven songs on the piano by rote, and therefore never understanding music or the piano. Some effort is required, but it certainly is at best a minor challenge. Take if from me – someone who has worked on this problem longer than anyone else – comprehending Lean leadership at the level of behaviors is only the beginning. You must move beyond that to fully comprehend time and information flow as the core functions of leadership. Complete descriptions of what Lean leaders need to know and do can be found in my books Practical Lean Leadership where you will learn about leadership beliefs, behaviors, and competencies, Speed Leadership where you will learn about leadership processes, leadership process errors, and how to correct them, and Moving Forward Faster where you will the learn the economic, social, and political beliefs that go into making great Lean leaders. Start with these three fact-based, non-fiction books. You will find additional important details in my books REAL LEAN and in Lean Is Not Mean. Click here to learn more about these fine Lean leadership books and what it takes to truly succeed as a Lean leader. Very informative piece Dr. Emiliani. I am practicing these elements everyday and the results have been favorable.